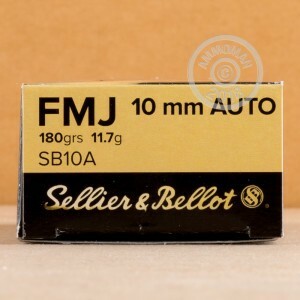 Numerous hunters and professional competition shooters use ammunition from Sellier & Bellot, a manufacturer from the Czech Republic. Sellier & Bellot products are renowned for their quality. These 10mm Auto rounds are no exception and will serve you well for range practice, local level matches, and recreational target shooting. Each cartridge is assembled using a reloadable brass casing and a non-corrosive Boxer primer. The case is topped with an 180-grain full metal jacket (FMJ) projectile. The FMJ's thick copper exterior cuts down on excessive fouling left behind between the lands and grooves of your barrel's rifling. A truncated cone shape lends the round excellent feeding characteristics alongside favorable impact effect; the flat nose creates a clean hole in paper or cardboard targets which is easily seen from the firing line. 180 grains is a common weight for the 10mm Auto and will match the performance of duty loads and carry options. 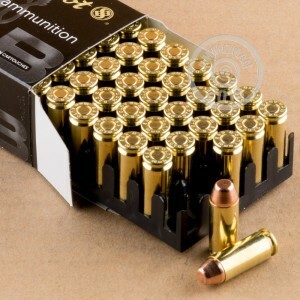 Buying in bulk with this 1000-round case is a great way to stock up for numerous range visits at an affordable price. 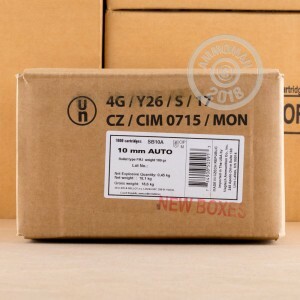 Very well priced range ammo, as accurate as it needs to be. This is my go to plinking ammo. Good price, good service, and very importantly, good ammo. Ran it thru my Glock 40, Gen4, and loved it. First time I shot the gun I put 15 out of 17 in the diamond. Burned clean and no misfires. Seems like very good ammo.